An article entitled “Woeful Suicide” that was posted in the Department of Health website mentioned that according to the World Health Organization (WHO), the Philippines has the highest incidence of depression in Southeast Asia and that there were more than 4.5 million cases of depression reported and 3 per cent of Filipinos were clinically diagnosed as depressed in 2004. WHO added that of the 90 depressives, only 30 will seek help. In addition, the study conducted by DOH in 2007 revealed that 15 out of 900 teenagers tried to commit suicide. In the University of the Philippines (UP), an increase in the number of mental health-related cases has been observed especially among students. UP Diliman PsycServe acts while participants spot for do’s and don’ts in attending to a person who might be in a crisis. To prevent these incidences from happening again, UP National Engineering Center (NEC) partnered with UP Diliman PsycServ, a task force created under UP Diliman Office of the Chancellor, to conduct Learning to be a Lifeline: A Basic Skills Workshop on Supporting Staff and Students. The workshop aims to provide basic knowledge and skills on how to become a lifeline or a person who can provide psychological support to others who are hurt or in crisis. Among the topics discussed were the common issues and manifestations, UP Diliman’s system for psychosocial support, and Psychological First Aid. 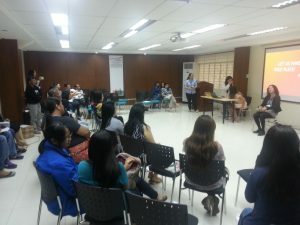 Participants of the workshop enjoyed the approach of UP Diliman PsycServ in handling the activity. One participant commented that the use of reporting through powerpoint presentation, sharing of personal experiences in small and big groups, and acting out these experiences made the workshop more effective, memorable, and impactful. Resource persons and participants posed for a group photo after the workshop. 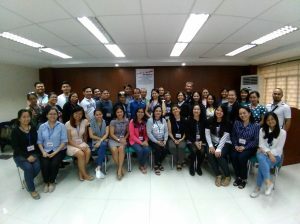 The workshop was held last 11 June 2018 at the Seminar Room B of UP NEC.